Most homeowners in Murrieta and Temecula know that pruning trees is a necessary part of keeping their overall landscape healthy and beautiful (not to mention, preventing certain dangers). But beyond that, many of you are… stumped. Why is pruning trees necessary, which ones need a trim, and what steps do you need to take? These are just some of the questions you might have. And while it would be impossible to cover everything in a single blog, this simple guide should get you started. Why do we prune trees? In nature, trees will often drop dead or diseased limbs. But if you wait around for that to happen, they could create a hazard by falling at the wrong time or in the wrong place. Plus, a diseased tree doesn’t look so great, and you’re at risk of losing the whole tree if disease spreads. So, pruning trees can keep them healthier, keep you safer, and preserve the beauty of your yard. When should you prune? There are many factors to consider, but first ask if your tree is evergreen or deciduous. Evergreen trees usually produce new growth in spring and fall, so trimming them in late spring is often ideal. Deciduous trees, on the other hand, grow all spring and summer. They should be pruned in late fall or winter. Use the right tools. As with any other task, using the correct tools will make a big difference when you’re pruning trees. Keep your tools clean and sharp, so that you can prevent unnecessary damage to the tree. Make sure you disinfect the blades before moving from one tree to the next, or else you risk spreading fungus, parasites, and other problems from one tree to another. Wound dressing is sometimes necessary. Depending upon the species of the tree and the size of the cut, it might be necessary to cover the cuts with pruning paint. Wound dressing can prevent insect borne disease which could invade the freshly cut area. Don’t take unnecessary risks pruning your Temecula trees. 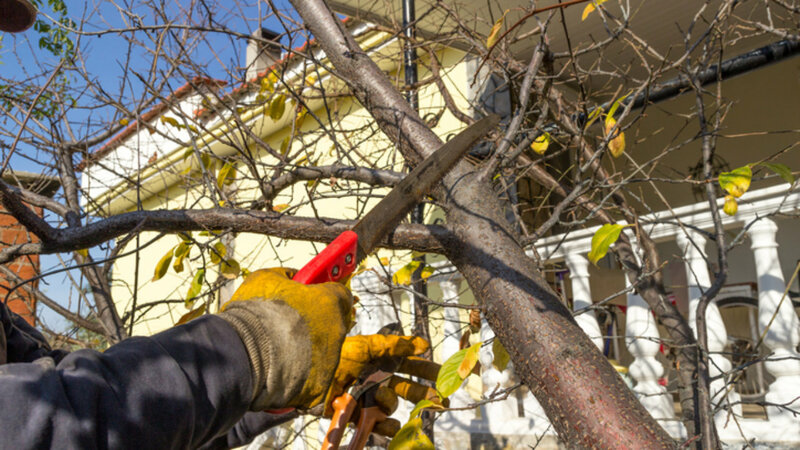 Pruning trees can be dangerous, what with the sharp objects, power tools, and climbing involved. It’s always better to protect yourself and your property by calling a professional, who has the right tools and expertise for the job, than to attempt something that is, shall we say, over your head. So on that note, please give us a call before attempting a complicated pruning job. We can offer you a quote on the work, so that you know all of your options before attempting a task that could be dangerous.